Hello everyone, this is Satoru Iwata of Nintendo. Since we weren’t able to reveal any new Iwata Asks interviews recently, it’s really been a while since we’ve been able to share a new interview with you. Last year I fell ill and had undergone surgery. Many of you were probably wondering if my illness was the reason for us not revealing any new Iwata Asks. But to be honest, I’d been thinking about taking a break from it so I could recharge, even before I found out about my condition. From about the end of last year I started thinking about putting it back on the table again, and was wondering what would be the right title to bring it back with. It was at that time when I saw people’s strong reactions to our announcement that we were making a remake of The Legend of Zelda: Majora’s Mask. I was surprised by those reactions, but then I knew what that title would be. I hope we can do a good job in trying to convey even a portion of the secrets of a game that deeply struck so many people’s hearts. It became quite a lengthy interview, but I hope you’ll follow through to the very end. At long last, you’ve finished making the game. Yeah, it was quite a lengthy process. The Legend of Zelda: Majora’s Mask1 that was originally released for the Nintendo 64 console was released almost exactly 15 years ago, so I have a feeling Aonuma-san has forgotten some bits and pieces.1. The Legend of Zelda: Majora’s Mask (Nintendo 64): An action adventure game released for the Nintendo 64 console in April 2000 in Japan. It was released in Europe in November 2000. 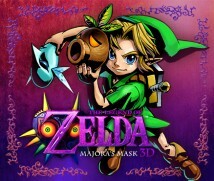 The Legend of Zelda: Majora’s Mask 3D is a remake of this game. First let’s start by asking you about the Nintendo 64 version. If I remember correctly, the development for Majora’s Mask began when somebody requested that it be made in one year. You’re right. Since we’d already made The Legend of Zelda: Ocarina of Time2, we had 3D models that we’d invested a lot of time in to build. This all started by [Shigeru] Miyamoto-san asking whether we could make a game in one year if we repurpose the models. But we were already talking about trying to make Master Quest3 for Nintendo 64DD4.2. The Legend of Zelda: Ocarina of Time: An action adventure game released for the Nintendo 64 console in December 1998 in Europe. The story of Majora’s Mask takes place a few months after the story of Ocarina of Time. Its game system and graphics were also used for Majora’s Mask.3. Master Quest: A special hard mode of the original The Legend of Zelda: Ocarina of Time, prepared for those that have cleared the game. The Ocarina of Time: Master Quest was originally developed as software for the Nintendo 64DD. However, it was not released as a Nintendo 64DD title and was instead later distributed on a special bonus disc for the Nintendo GameCube console.4. Nintendo 64DD: A peripheral for the Nintendo 64 console sold by RandnetDD. By plugging in this Disk Drive underneath the console, it expanded the system’s data storage, allowing it to rewrite a large amount of data. This product was on the market in Japan only from 1999 to 2001. At the time when Ocarina of Time came out, there was a plan in the works to release Master Quest for 64DD. Correct. We were told to repurpose the dungeons from Ocarina of Time and make a game out of it, and I was handed the baton to make that happen. However, when we made Ocarina of Time, we made those dungeons thinking they were the best we could make. That’s when Miyamoto-san asked me to remake them, so I hesitantly obliged… but I couldn’t really get into it. To you, you’d just made the ultimate dungeon, so you didn’t want to ruin a perfect formula. Exactly! So I secretly started making new dungeons that weren’t in Ocarina of Time, and that was much more fun to me. So, I built up the courage to ask Miyamoto-san whether I could make a new game. He replied by saying it was okay, as long as I could make it in a year. Didn’t Ocarina of Time take three years to make? I remember those days very well. Ocarina of Time came out on November 21st 1998 in Japan. At around that time I was working on finishing up Super Smash Bros.5, which was due out in January in Japan. I was at the Nintendo Kyoto headquarters for a meeting to prepare for its launch, and I bought Ocarina of Time on my way home.5. Super Smash Bros.: An action multiplayer game released in November 1999 in Europe for the Nintendo 64 console. This game was developed by HAL Laboratory. Mr Iwata was the president of HAL Laboratory at the time, and contributed to the programming during development of the game. I actually feel like we were working very hard around the same time, so I remember it very well. Eventually Ocarina of Time came to be considered the pinnacle of 3D games and was praised all over the world, but on the other hand some people were asking why Zelda games only came out once every three years. Right. The game’s release date was delayed several times. (laughs)That clerk must have really been waiting for the game to come out! After causing reactions like that, Ocarina of Time was finally released after multiple delays. With key learnings about how it took too long for it to come out, Miyamoto-san must have wanted the next game to come out much sooner, like in one year. So how did you respond when he asked you to make it in a year? Did you say, “Sure, I can do it”? No, I was holding my head! I rolled and turned thinking what kind of software I should make, and when I met [Yoshiaki] Koizumi-san6 around that time, I asked for his help. He was working on a plan for a different game at the time, one where you would play in a compact game world over and over again. Coincidentally, Ocarina of Time had a system that controlled the time…6. 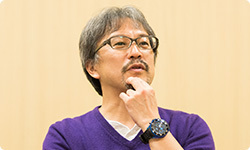 Yoshiaki Koizumi: Co-directed The Legend of Zelda: Majora’s Mask for the Nintendo 64 console with Eiji Aonuma. After Majora’s Mask, he was involved in the development of 3D Super Mario games such as Super Mario Sunshine (2002), Super Mario Galaxy (2007), as well as Flipnote Studio (2009). Currently works in the EAD Tokyo Software Development Department. He appeared in past Iwata Asks columns such as Iwata Asks: Super Mario 25th Anniversary Volume 3: Super Mario Developers, Iwata Asks: Super Mario Galaxy Volume 1: The Producer and Director, Iwata Asks: Super Mario Galaxy 2 Volume 2, Iwata Asks: The Legend of Zelda: Ocarina of Time 3D Original Development Staff Part 1, Iwata Asks: Super Mario 3D Land Volume 2: The Producers, and Iwata Asks: Super Mario 3D World. The sun rose, and there was nightfall. The concept of time existed in that game. Right, so Koizumi-san told me that he would help me out if he could use that system of time passing to make a game where you would be playing the same moments in time over and over again. (laughs) From there, the “Three-Day System”7 was born. It’s where you would be playing the same three days over and over again. 7. Three-Day System: When three days pass in-game, the moon will fall and destroy the world. Therefore, this is a system where the player has to control time and repeat those three days over and over again to complete the game. You needed a completely new idea to make something in such a short turnaround like one year, and that was the “Three-Day System”. Right. But at first, it was one week. Three days was originally one week? That’s right. But when you returned to the first day it was like, “Do I have to go through an entire week again…?”, so we thought three days would be just right. (laughs) In this game the townspeople do different things each day and many different things happen, but when the timespan becomes a week, that’s just too much to remember. You can’t simply remember who’s where doing what on which day. Moreover, you probably wouldn’t have been able to make it in a year if you were aiming to make a game filled with so much content for seven days. Right, we never would have been able to do it. We felt it would be best to make it a three-step process, and we compressed all sorts of things we had planned for over a week into three days. That’s how it led to the game feeling like it’s packed to the gills with content. You squished all sorts of ideas you were originally planning to use in a week into only three days.